From the Hancock County Courthouse, go 2.6 miles northeast on Hwy 22/15 split and then go right on Hwy 22 for 10.3 miles to the Powelton Baptist Church. Turn right in front of the church on County Road 27, Jones Bridge Road, and go 2.0 miles to a woods road. Turn left on the woods road and go 0.6 mile to the grave on the left of the road. The cemetery can be seen from here. 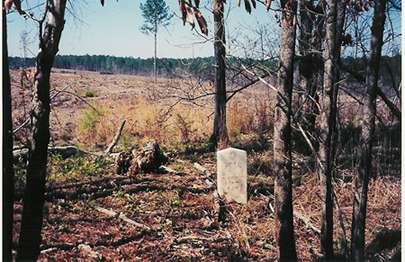 This timber has been clear cut and the cemetery is in a small group of pines at the top of the hill, as of October 2003. Company D, 5 Ga. Inf. At least 3-4 other graves marked by fieldstones or depressions. Possibly more.